Bravely trampling on the errors of the unbelievers. Glorious Nektarios you contested courageously. On the eleventh men dreadfully decapitated Nektarios. Saint Nektarios, who was baptized with the name Nicholas, was from the village of Vryoulla in Ephesus of Asia Minor. He was raised by a poor yet pious family. At seventeen his father died, so being without a profession he hired himself to a wealthy Muslim and tended his camels, along with six other Orthodox Christian men. At one point a plague afflicted the area of Ephesus, so Nicholas and his six companions, along with their Muslim masters, took refuge in the countryside together. Thinking that they alone survived the plague, and that they lost their families, the Orthodox Christians began to think they had nothing, so in order to survive they adopted Islam. After some time, when the plague had ceased, Nicholas and his companions returned to the city. There Nicholas was surprised to find his mother had survived. But seeing her son dressed as a Muslim, she became angry, and said: "Don't come near me! What kind of clothes are those I see? Go away from here as soon as possible. I did not give birth to a Muslim. I gave birth to Nicholas the Orthodox Christian. Go away so my eyes don't look upon you." To this, Nicholas said nothing, Her words pierced his heart as though he had been struck with arrows. Instead Nicholas turned to the Lord and asked for forgiveness. Nicholas did not return to his employer, but went to Smyrna where he met his uncle, a ship owner, who offered him hospitality. When Nicholas told his uncle everything, he dressed Nicholas in western clothing and put him on a ship for Constantinople, from where he was to go to Russia. He also advised his nephew to repent, live in the fear of God, and never forget his apostasy. Nicholas departed for Constantinople, and from there arrived in Romania. For reasons unknown he felt the place would endanger his soul, so he returned to his uncle in Smyrna. Christians there introduced Nicholas to an Athonite monk, who counseled him to go to Mount Athos where he would find his salvation. Arriving at Mount Athos, he submitted himself under the direction of the venerable Hatzi-Stephanos at the Skete of Saint Anna, in the Hut of Saint John the Theologian. There Nicholas wept for his sins and grew in his faith, and was tonsured a monk with the name Nektarios. Living a life of prayer, obedience and asceticism, Nektarios asked permission to become a martyr, but none of the elders thought he was ready. They advised him to wait. In time, after much spiritual preparation, Nektarios received permission to fulfill his desire for martyrdom. He therefore left the Holy Mountain with Hatzi-Stephanos, and returned to Vryoulla. There, three days before Ramadan, he presented himself before the local judge, and said in Turkish the story of why he embraced Islam, and his desire to return once more to the faith of his upbringing, even if it would cost him his life. The judge managed to persuade the adamant Nektarios to think about his decision, so Nektarios spent the night in prayer, and the next day, a Sunday, he presented himself before the judge once more. There he confessed that he was deceived to embrace Islam as a foolish young man, and now that he had matured and come to his senses, he wept for his sin of apostasy and trampled on the Islamic faith. With this the judge became very angry, so he was sent to the military commander, who saw Nektarios was young and handsome, and he spoke to him calmly. Repeating to the military commander all that he told the judge, he was sent to prison in chains. There he met other Orthodox Christians, and taught them about the faith. Many Muslims visited Nektarios to convince him to remain a Muslim, but he remained firm in his faith. Five days later Nektarios was brought before the governor for questioning. Nektarios confessed his faith in Jesus Christ, and repudiated Islam. The governor made him promises of glory and honor if he would remain a Muslim, otherwise he would die a merciless and cruel death. To this Nektarios responded that his promises were empty and his threats brought on no fear, therefore he encouraged the governor to get everything over with as soon as possible. At a loss, the governor sent Nektarios back to prison, where he was tortured, and he remained firm in his faith. On Friday night Nektarios asked the Christians who were inspired by his struggles if Holy Communion could be brought to him. On Saturday morning he communed and was armed with divine grace. The governor then tried again to convince Nektarios to remain a Muslim, otherwise the next day, which was the Lord's day, he would have him beheaded and burned so that even his ashes would not remain. Nektarios received this news with joy. The next day the governor sent Nektarios to the judge who proclaimed the sentence, and had Nektarios brought to the place of execution, where an Arab executioner awaited him. To frighten Nektarios, the executioner hit him with the sword a few times without doing serious damage. Nektarios remained calm. Then the executioner came down hard and struck off his head. His body was thrown down a dry well, which was covered by stones and other objects so the Christians would not be able to access it. His execution took place on July 11, 1820 when he was twenty-one years old. 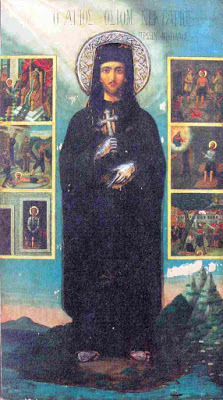 Hatzi-Stephanos managed to take the skull of Saint Nektarios with him to the Skete of Saint Anna. And a portion of his relics was given to his pious mother, which worked many miracles. Today a processional icon of Saint Nektarios with scenes from his life can be venerated in the Church of Saint George the Great Martyr in New Ionia, a suburb of Athens, where his fellow countrymen annually observe his feast. The ornament of Vryoulla and fervent protector, you have shown yourself to be Nektarios, as an Athlete of Christ, in these last days. You lived well in asceticism, on the mountain of Athos, where you contended with a godly mind and destroyed the serpent. Wherefore Venerable Martyr, with longing we celebrate you. Divine nectar of the love of Christ, by your virtuous life on Athos, you received your soul Nektarios. You ran towards the contest, with a steadfast heart, and you glorified Christ, in your revered contest, by Whom you were glorified, on behalf of the world, for whom you always intercede.